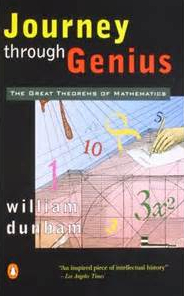 This post is review of the book 'Journey Through Genius: The Great Theorems of Mathematics' written by William Dunham. You can translate it in any other language – see the right hand widget for converting it in the other script. Hindi (Devnagri) kee is chhitthi mein William Dunham kee likhee pustak 'Journey Through Genius: The Great Theorems of Mathematics' kee smeeksh hai. ise aap kisee aur bhasha mein anuvaad kar sakate hain. isake liye daahine taraf, oopar ke widget ko dekhen. Agreed . It would have added extra interest during mathmatics classes . But may be due to unavailability of internet data was not widespread that time , so that teachers can explore more and distribute more among students . सर, मेरे बच्चे ७वे और ९वें क्लास में पढ़ रहे हैं, उनके लिए गणित और विज्ञान की पुस्तकें सजेस्ट करने की कृपा करें जो सरल भाषा में हों और पढने में रूचि बढायें.